Chris Smither first started playing music as a kid, and after winning a battle of the bands Chris headed to Boston at the urging of Eric von Schmidt It was the mid-'60s and acoustic music was flourishing. In Boston, he forged a lifelong friendship with Bonnie Raitt, who made Smither's "Love Me Like A Man" her signature song. Such was his reputation that by the time Smither recorded his thirdalbum, "Honeysuckle Dog" such luminaries as with Lowell George and Dr. John were helping out on the recording. 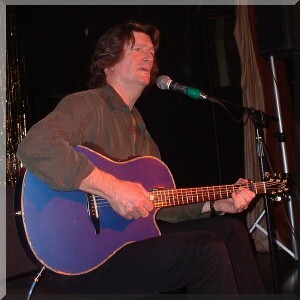 Chris Smither maintains a full-time schedule of nationwide touring and regular releases consistently brilliant albums, cementing his reputation as one of the finest acoustic musicians in America. His album "Happier Blue" received the NAIRD award as Best Recording of 1993. In early 1997 Chris performed concert dates with B.B. King, Bonnie Raitt, Nanci Griffith, and Ramblin' Jack Elliott. In 1999 , in addition to the US and UK, he toured New Zealand and Japan, returned to the venerable Jazz & Heritage Festival in New Orleans, and joined John Prine and Joan Baez on tour. His new album, "Live As I'll Ever Be" features all all the favoured songs captured live. And as usual, he'll be out on the road performing his lifetime of songs in his signature rootsy style, with that stunning blue guitar and his tapping feet - in clubs and festivals across the globe. Bathed in the flickering glow of passing headlights and neon bar signs, Smither's roots are as blue as they come. There is plenty of misty Louisiana and Lightnin' Hopkins in Smither's weathered singing and unhurried picking. Chris Smither has quietly achieved a quasi-mythic status as an outstanding musician and composer. Chris Smither is one of the finest interpreters of classic blues and contemporary roots music on the scene today. His penchant for lyricism sometimes makes it easy to overlook his Delta-inspired guitar chops, which boast a strong rhythmic sense and a beautiful, fluid, fingerpicking style.